 Tarzan takes on a band of greedy ivory hunters who have enslaved the men of the Lykopo tribe to round up a huge herd of 100 bull elephants. The female employer of the poachers, Lyra, sends her men to kidnap Jane as insurance against Tarzan's interference but the job is bungled and the tree house is burned down. 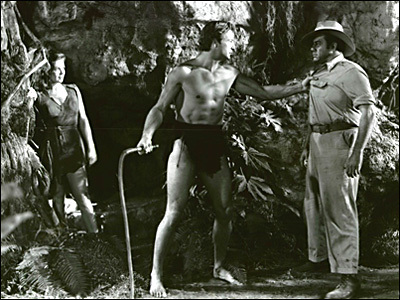 Tarzan, believing Jane dead becomes deeply despondent and is easily captured by Lyra's brutal henchman, Vargo, and his cronies. 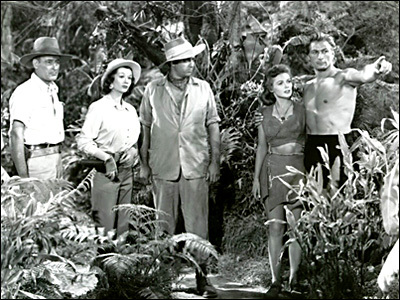 Jane has escaped the fire and Lyra and her men find her wandering in the jungle searching for Tarzan. When they take Jane to see Tarzan he throws off his despair and is ecstatic to find his beloved alive and safe. The joy is short-lived when Lyra threatens to kill Jane if Tarzan refuses to help herd the elephants into the stockade the Lykopos have built. Tarzan calls the elephants with his ape-cry but at the last minute he and the Lykopos close the gates of the stockade from within forcing the elephants to trample the camp. Lyra, Vargo and their men are trampled to death, the elephants are safe again, the Lykopos are liberated, and Tarzan and Jane are together again.